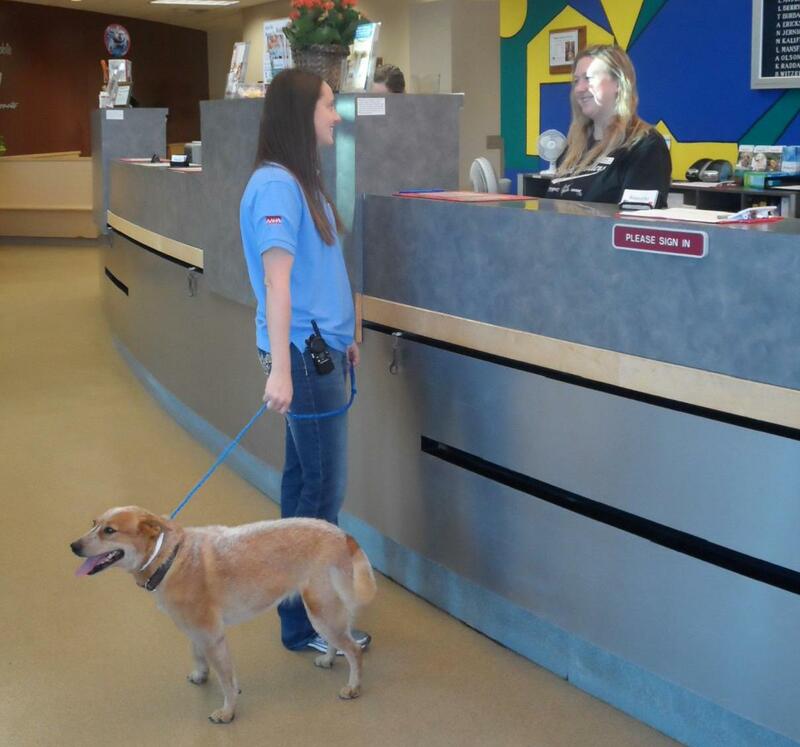 Ruby gets checked in at the front desk. is very important that you make sure that the doctor has a phone number where we can reach you today. This way, the doctor can call you if there are any extractions or other treatments needed during the dental procedure. 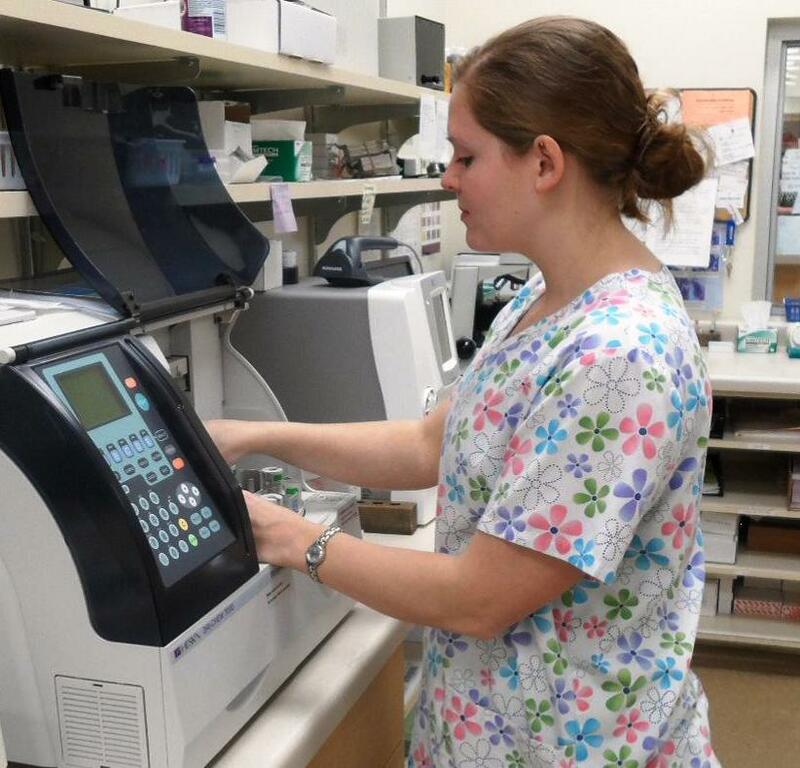 Ralston Vet Technician running Ruby’s blood work. Ruby’s next stop after check-in is our treatment area. This is where we will get a blood sample from her to run pre-anesthesia blood work. This test assesses the health of her liver and kidneys, as well as check her glucose, protein, and electrolyte values. In some instances, there will be abnormal values. The doctor will then call you and recommend doing further diagnostics or treatments instead of the dental procedure. given during the procedure to help maintain adequate blood pressure and hydration. This IV catheter is also available in the situation that an emergency develops and we need to act quickly with medication. Monitoring Ruby during the dental. Ruby is then given medications to cause her to be anesthetized. General anesthesia is required for proper oral examinations and dental cleanings in animals, as the majority of animals do not open their mouths willingly. If there are any painful teeth in the mouth, there is a chance for injury to the person doing the procedure. 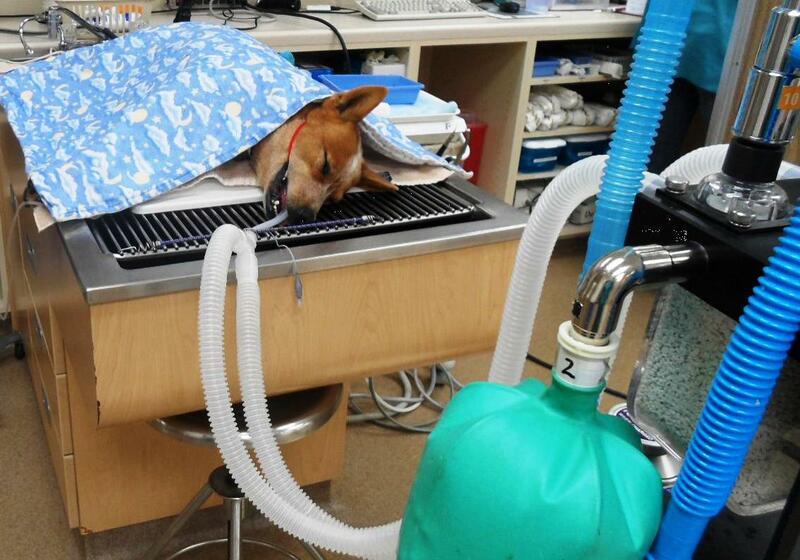 During the procedure, she is monitored closely by a licensed technician and veterinarian. Her heart rate, respiratory rate, oxygenation level, blood pressure, temperature, and anesthesia depth are monitored during the procedure. 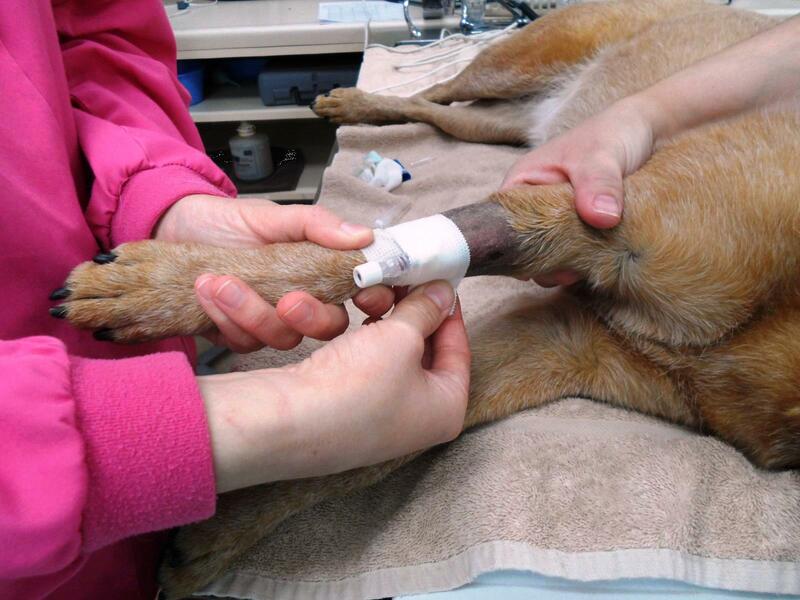 An endotracheal tube is placed in her trachea to keep her airway open and water and debris out of her trachea (wind pipe). Ultrasonic scaler to remove dental calculus from her teeth. 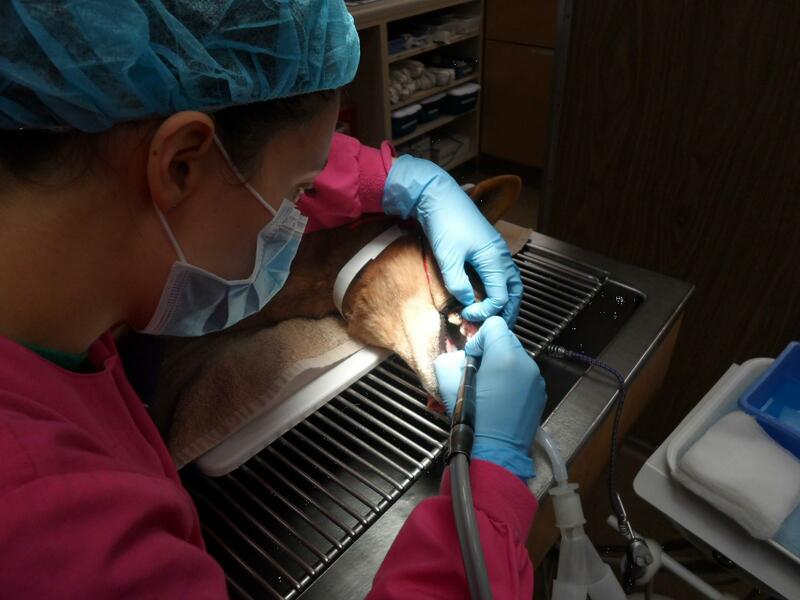 The technician working with Ruby then uses an ultrasonic scaler to remove the dental calculus (tartar/plaque) from her teeth. The scaler moves at very fast speeds and uses vibration to help remove the calculus. The scaler is also used below the gum line to remove any calculus that is under the gingiva. She then uses a probe to detect problem areas surrounding the teeth. In most pets, pockets between the tooth and the gum that are deeper than 2mm are abnormal and can be an indication of infection, bone loss, or other problems with the tooth. After scaling and probing the teeth, x-rays of the full mouth are taken. Not only do we take x-rays of the teeth that are present, but also those that are not present. Many times there are teeth that have been broken off and there are roots still present below the gum line. 25% of animals with seemingly normal mouths will have problems under the gum line that are only found with x-rays. These x-rays will also give the veterinarian a “base-line” set of pictures of your pet’s mouth for comparison in the future. After the x-rays are finished, the veterinarian will examine the mouth and determine if there is any further treatment that is needed. This is when the veterinarian will call you and discuss what the next steps are for your pet’s teeth. If there are no further treatments needed, we will move forward to the next steps in the dental prophylaxis without contacting the owner. When the doctor is done performing the necessary treatments, the teeth are polished and fluoride is applied on the teeth. After this, Ruby will be taken off of anesthesia and when she is awake enough, we will move her to our surgical recovery area. Dr. Witzel going over xrays with the owner. 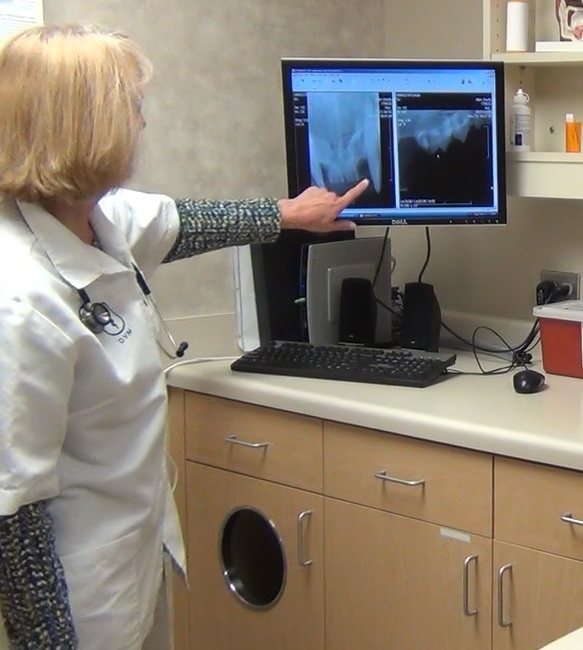 At her check-out time, the veterinarian will go over what was found during Ruby’s dental procedure and what medications and special instructions she should have at home. At-home care is also discussed at this time. If your pet had a lot of extractions performed, the veterinarian may recommend having your pet return in about a week to make sure that your pet’s mouth is healing appropriately.